Children are the future of hunting — but that’s just one reason they should learn how to hunt. Kids are like little mirrors, reflecting the things they see and hear the adults if their lives do and say. Hunting is no exception. Surveys have shown that, by an overwhelming margin, new hunters come from families that hunt. So when your own kids (and their friends too!) show an interest in hunting, take them into the woods with you. Not only will this get them involved in the sport, but teaches them so much more about real life than any other sport I can think of. Here are 10 reasons to share the joy you get from hunting with your kids and teach them to become proficient woodsmen, as well. You know the drill. You’re driving the family someplace and the kids are texting or on the internet on their phones. Nobody’s talking to each other. One of the best things about heading to the woods to go hunting is the “alone time” it gives you. They are forced to pay attention to you, and the world around them. This fosters personal communication and makes the kind of memories that will not soon be forgotten. Leave the electronics in the truck and get to know each other. Hunters are made, not born. Virtually all serious hunters got started by being taken by their dad, grandfather, or maybe a family friend. They then pass this tradition down to the next generation. By taking your kids hunting you are carrying on your own family tradition or, if you were the first in your family to get hooked on hunting, starting a new one. Be a teacher in the woods knowing that your son or daughter will, at some point in the future, do the same for their own children. No doubt about it -- hunters are the world’s foremost conservationists and environmentalists. The North American Model of Conservation is one of the world’s great environmental success stories and one not told enough to the non-hunting public. I promise you that as soon as you begin teaching your children about Mother Nature and wildlife, they will become interested and want to learn more. Teach them how hunters voluntarily fund today’s wildlife and habitat programs, about harvesting only what they need and the importance of the carrying capacity of the land. The sad truth is, as a percentage of our growing population, hunters are not growing. In a nation with a population of over 325 million people, there were only 14.84 million paid hunting license holders in America in 2015. In contrasts, back in 1995 almost 10 percent of the population hunted; today it’s under 5 percent. As hunters and conservationists it’s our job to keep the spirit and the sport alive. Taking your own children afield is a big step in that direction. There’s no doubt that getting kids up off the couch and away from their electronic devices is good for them. In fact, being outdoors has been shown to help people relax and lower blood pressure, as well as being good for the mind and the spirit. Taking kids hunting helps teach them the importance of slowing down and enjoying the simple things in life. While some hunting styles and disciplines require minimal physical effort, many require you to be as fit as you can be. If you’ve ever hiked over a ridge just to see what’s on the other side, tracked a deer through thick brush, busted through knee-deep snow hunting pheasants in winter, you understand the importance of being physically fit when you hunt. Taking your children hunting will help promote a physically fit lifestyle and give them increasing motivation to hit the gym or go for a walk or run. You can learn everything you need to know about success in life in the hunting fields. Discipline, patience, endurance, learning to live with disappointment and failure, hunting helps develop life skills that will help make well-rounded adults out of your kids. One thing’s for certain -- hunting is rarely as instant gratification game. Teaching kids the importance of being in it for the long haul is one of hunting’s most valuable lessons. 3) Be Responsible For Your Actions Think about it. When hunting you’re handling a dangerous weapon. If lucky, you kill an animal, or animals. You respect other hunters, and you leave the woods as clean and pristine as you found them. The ethics and responsibilities required of hunters can carry over into life in general, and are those often not taught in schools. One of the most important things an adult can do for a child is to teach them how to do things with the goal of the child soon being able to do it themselves. Starting out you’ll show them everything -- how to get dressed, how to watch the wind, stay quiet, pick the right spot, set up and make the shot, then properly and respectfully care for an animal once it’s down. Soon they’ll be making the decisions. When that happens their confidence in themselves will soar, and they’ll think, “If I can do this, then I can do anything I put my mind to!” Bingo. Our precious Second Amendment guarantees that there are firearms everywhere in our society. Sooner or later your children will come in contact with them. To those who have no experience with gins, they’re terrifying and dangerous. Knowing how to safely shoot and handle firearms is therefore an essential skill for people to learn. 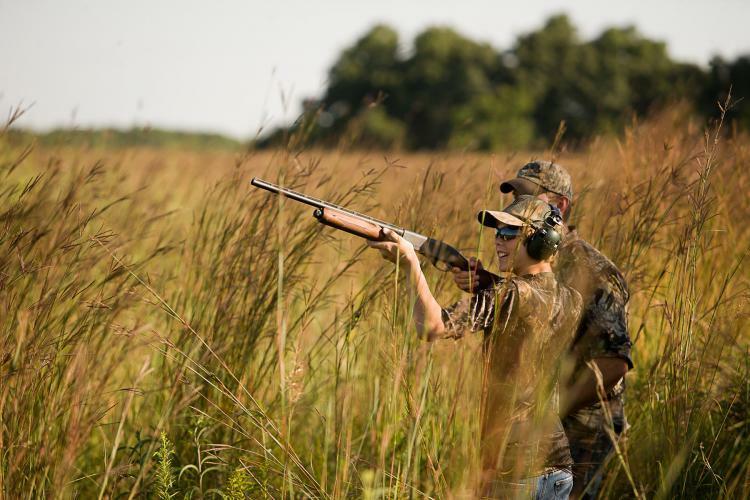 Teaching your children to hunt is a great way to teach them to both respect guns and how to handle them safely.